Today the Kenya government signed guarantee deals to secure Kenya Airways (KQ) continued financial support from EXIM Bank US, and a consortium of Kenya banks and also converted its debt to more equity, significantly altering the ownership structure of the airline. The Government had advanced loans of Kshs 4.2 billion and $197million to KQ, and the debt conversion will see a 19.1% increase in their shareholding. Aside from, that Kenyan banks, which were owed $217 million, received a 38.1% shareholding in KQ in exchange for $167 million of that debt. The $267 million government debt and bank conversions are part of a series of complex restructuring deals. The resultant shareholding of KQ will be Kenya Government 48.9%, Kenyan banks 38.1%, KLM 7.8%, and other shareholders will have 5.2%, after a massive dilution that shareholders approved at an EGM in August 2017. Not all bank and all government debts were converted as that would have seen the government stake go above 51% and they wanted KQ to remain a private company, not a state/parastatal one. The restructured board will comprise 3 directors from the Government, 2 from the banks, and KLM will have 1 representative. Treasury Cabinet Secretary Henry Rotich said that the guarantee and restructuring by the government was not a bailout and the Government expected repayments of dividends from KQ within the next decade. The Government had been faced with two options with regard to KQ one of which (folding the airline) it could not pursue, and it chose the other, to support the airline, for which, the Cabinet confirmed through an independent business case study by the Seabury Group, that the airline could, through shareholder support, be turned around and have a viable future. He said the capital optimization would enable the airline to trade on its own balance sheet. 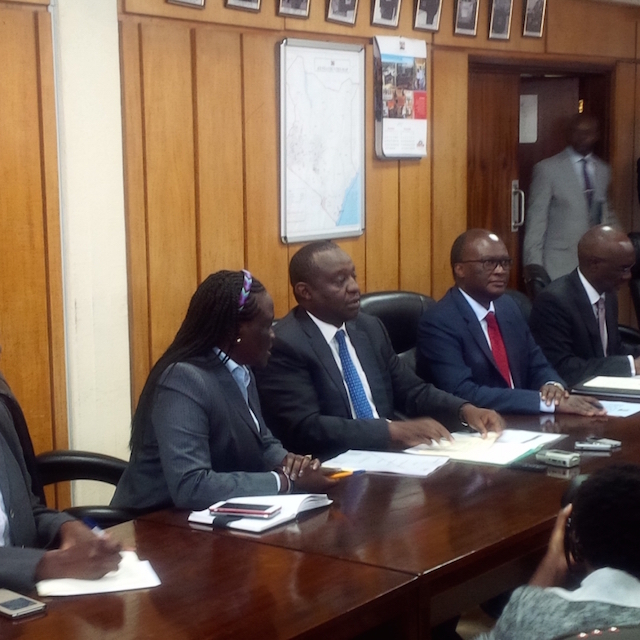 Transport Cabinet Secretary James Macharia said that aviation sector, led by Kenya Airways, contributes 10% to Kenya’s GDP and was a central engine that supports other economic activities like investments, horticulture, and tourism. Also by having a strong KQ, this would strengthen the case to make Nairobi’s JKIA airport a regional hub and his Ministry was in the process of finalizing plans to add a second runway and expanding existing terminals to enable the airport to serve 12 million travelers a year. The bank shareholding will be through KQ Lenders Co, a special purpose vehicle that will be managed by Minerva Fiduciary Services of Mauritius and the agreement was signed by Madabhushi Soundararajan a career-banker, as director. This entry was posted in Corporate governance, Investing in Kenya, Kenya Airways, Kenya privatization, KLM, NSE investor awareness and tagged Airline, Bailout, Guarantee on November 14, 2017 by bankelele.